Home » General Interest » How does Recycling Work ? There is an ever growing collective awareness, some would even say guilt, of the consequences of the damage that mankind is doing to mother Earth as a consequence of our mass consumer, throw away lifestyles. To assuage this guilt more and more people are getting into recycling. But what happens to it AFTER we place it in the recycling bins ? Where and how is it recycled ? At it’s core, recycling is a pretty simple concept: take something that isn’t useful anymore and make it into something new instead of just throwing it away. It can be anything from recycling old paper into new paper to making an old hubcap into a decorative birdbath. However what can be and how it IS recycled isn’t simple. This is why at recycling collection points they ask you to sort your recylable materials int types. We look at each of the most common onesin turn below. It’s rare for a recycled product to be exactly the same as the original material from which it was recycled. 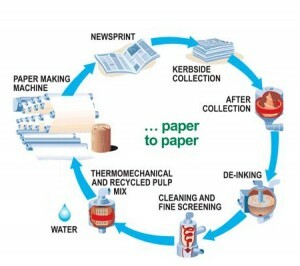 Recycled paper, for example, contains ink residue and has shorter fibers than virgin paper (paper made from wood pulp). Because of this, it may be less desirable for some purposes, such as paper used in a copy machine. When a recycled good i­s cheaper or weaker than the original product, it’s known as down-cycling (or downstream recycling). There’s room for debate on this aspect of recycling, but many recycling processes require less energy than it would take to manufacture the same item brand-new. Manufacturing plastic is very inexpensive, and some plastic goods can be difficult to recycle efficiently. In those cases, the recycling process probably takes more energy. It can also be difficult to weigh all the energy costs along the entire chain of production. Recycling steel certainly uses less energy than the entire process of mining iron ore, refining it and forging new steel. 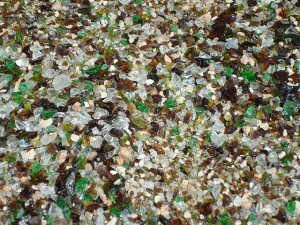 Howvevr recycling isn’t just about energy but about re-using some of mother Earth’s precious, limited resources. Collecting recyclable materials has at it’s heart one basic concept : the separation into various categories and types of materials like paper, plastics, glass (clear and coloured). The separation can happen at curbside collection or when you place them in communal bins. There may also be further refinement when each of the types of materials arrive at the processing centres. The use of paper in industrialized nations continues to increase, in some cases accounting for almost 20% percent of all household rubbish. Although the trees used to make new paper are a renewable resourcer recycling paper results in a significant net savings in terms of water and energy used, as well as pollutants emitted into the environment. From curbside and communal collection points, paper is sorted based on the type of paper, how heavy it is, what it’s used for, its color and whether it was previously recycled. Then a hot chemical and water bath reduces the paper to a soupy, fibrous substance. Magnets, gravity and filters then remove things like staples, glues and other unwanted chemicals from the pulp. The ink is removed by either a chemical wash, or by blowing the ink to the surface where it’s skimmed off. The pulp — which may be bleached — is then sprayed and rolled into flat sheets, which are pressed and dried. Sometimes new pulp is added to the recycled pulp to make the paper stronger. The giant sheets of paper, when dry, are then cut into the proper size for resale back to consumers. Recycling glass represents significant energy and cost savings over making brand new glass, because there’s virtually no down-cycling when glass is recycled. There are two ways to recycle glass. Some companies collect bottles from their customers and thoroughly wash and disinfect them before reuse. 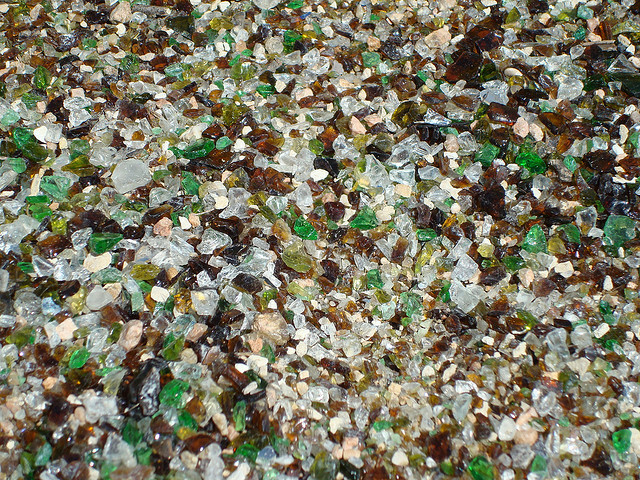 Other glass recyclers sort the glass by color (clear, green and brown glass shouldn’t mix because it’ll give it a mottled effect). The glass is ground up into fine bits known as cullet, thoroughly sifted and filtered using lasers, magnets and sifters, then melted down and reformed into new glass. Only glass used in containers like jars and bottles is commonly recycled. Window glass and glass used in light bulbs is too expensive and difficult to recycle. The recycling of scrap steel from cars and old buildings has a long history. Steel is relatively easy to recycle — giant machines shred junk cars and construction waste. Once sorted, scrap steel is melted down and re-refined into huge sheets or coils. These can be shipped to manufacturers to make car bodies or construction materials. Pick up a soda bottle and look at the bottom. It will have either have “PET” on its base, or a number enclosed in the recycling sign. When you drop this bottle into the recycling bin, it’s sent to a separation center where different plastics are separated by family type, either by hand or by machine. The separated plastic parts are then ground up into fine chips, which are then fed into a machine called an extruder. There the chips are melted and re-formed into pellets that can be used to make benches, pots, artificial lumber, and many other items. What would the world be like without plastics? Things that we take for granted — like a “to go” cup of hot coffee — would be very expensive. Stain-resistant trousers, polyester clothing, and Gore-tex jackets would all be non-existent. Most planes, trains and cars would be louder and produce more pollution per pound than current automobiles. Everyone’s life expectancy would be shorter, because food and drugs would perish easily. Electronic items would be large and cost a lot. Mobile phones would weigh over 3 Kgs (6 lbs)! Computers would not be as common, since there wouldn’t be integrated circuits that are made out of plastics. Aluminum cans are one of recyclings ‘poster boys’ and an example of a success story — when they’re recycled, they save 95% of the energy used to make new cans, not to mention the energy usage and pollution caused by the mining and refining of bauxite, the mineral from which aluminium comes. In 2006 the U.S. recycled 51.9 billion cans alone. When recycled, cans are chopped up, then heated to remove the paint coating. The pieces melt and mix in a vortex furnace. After being filtered and treated, the molten aluminum is poured into ingots, which are rolled into flat sheets ready to be made into new cans.